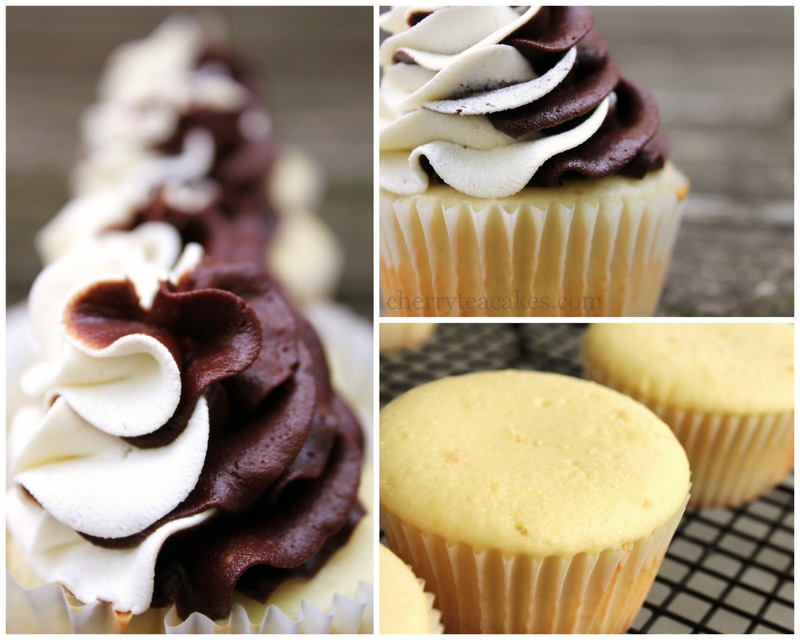 A lightly lemon flavored cake batter with chocolate and white vanilla frosting swirled atop. My take of an iconic NYC treat in honor of my weekend trip! Just a few days ago I got back from NYC. It should have been closer to just a few hours ago, but I have the feeling that the raccoon I ran over a few weeks ago must have been Karma's favorite pet. First of all, a raccoon? Seriously? I hit a raccoon driving home in DC! Okay, so it’s probably not about that, but I had a CRAZY weekend! I don’t understand how literally nothing went according to plan. First, a trip to NYC to spend some time with my friend Kim. So fun! We ordered in dinner from Kitchinette and spent the night planning away at our fun weekend! The big plan???? HOT AIR BALLOONS! We went to the The 28th Annual Quick Chek New Jersey Festival of Ballooning!!! It was fantastic!!! The balloons were absolutely gorgeous! And who knew the sky was that gorgeous at 6 am! No seriously, we woke up and drove out of the city at 5 am. It was an early morning! You might make fun of me for this picture but let’s face who I really am. I am a big kid at heart. Silly. Goofy. Carefree. With no inhibitions….which I probably should have by this age. Eh. Who needs ‘em? But yes, I am a big kid at heart. Little kids love little balloons. I’m a big kid, I love big balloons. But when we got back to NYC we had a little trouble finding parking. That’s not surprising in the city. The parking situation is a little ridiculous, especially now that the Financial District is under construction on every other street. But the good news is I did eventually find a parking spot! It was just in Alexandria, Virginia. I decided to drive home instead of paying so much for parking and spend the money on coming up a few other weekends. So I spent the rest of my weekend in DC, and that brings me to my second “Karma is our to get me” story: the ten minute tornado. My roommate and her fiancée are sitting with me in our living room, we’re eating lunch, and the sky goes from bright and sunny, to dark and ominous in about ten seconds. The winds start whipping through the streets and a part of tree falls into our lawn. Not being the brightest, we walk out on the porch, look at it, and then Hugh, the good man that he is pulls us back inside….and then the entire tree falls in our yard! 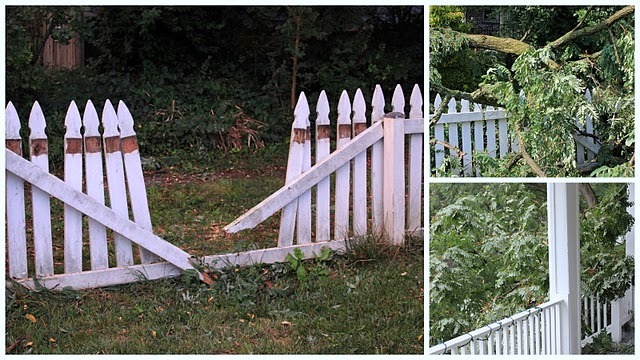 It destroyed our fence, and hit our gutter. That’s how close it was to the house and porch we’d just been standing on!We were so lucky. Our neighbor’s car was under their tree. The weird thing? That storm lasted less than ten minutes. Bizarre. So here are some black and white cupcakes, a caker’s take on the city’s classic cookie, and heck the swirls might as well be in honor of the swirling tornado that took out my white picket fence. Either way: Karma hates me lately. What a weekend! I hope you have better luck with these than I had all weekend! Line a cupcake pan with wrappers. Preheat oven to 325. In a stand mixer, add cake mix, lemon zest and water. Mix on low with paddle attachement until well combined. Add oil. Mix. Add egg whites one at a time beating well in between each addition. Bake cupcakes for 12-15 minutes. Whip in a stand mixer using a paddle attachment butter, and flavoring till creamy then whip in powdered sugar and cocoa. Set aside until ready to use. Whip (with a paddle attachment, not wisk!) butter, salt and vanilla till creamy. Then whip in powdered sugar and white food dye. Set aside until ready to use. Take a decorating bag and if you are using a decorating tip attach it now. Lay the bag on the counter. Fill the bottom half with white buttercream, and then fill the chocolate buttercream on top. If you are holding the bag upright, you should have chocolate on the left and white buttercream on the right. Pipe out swirling to keep the different buttercreams to their respective sides.